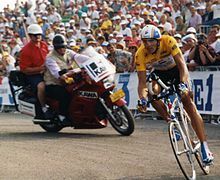 Miguel Indurain (ESP) Banesto 95h 57' 09"
Toni Rominger (SUI) CLAS–Cajastur + 4' 59"
Djamolidine Abduzhaparov (UZB) Lampre–Polti + 2h 03' 33"
^ a b Abt, Samuel (30 October 1992). "Tour de France Has Rocky Road Ready For Riders in 1993". New York Times. ^ "Les premières équipes pour le Tour" (in French). Le Soir. 19 May 1993. Retrieved 3 April 2013. ^ Deblander, Bruno (16 June 1993). "Sept maillots pour completer le generique du Tour de France 1993; Six invitations et une fusion" (in French). Le Soir. Retrieved 3 April 2013. ^ Abt, Samuel (17 June 1993). "Angry U.S. Bike Team Says 'No' To Sharing Tour de France Slot". New York Times. Retrieved 3 April 2013. ^ a b c d e f g h i j McGann, Bill; McGann, Carol (2008). The story of the Tour de France: 1965-2007. Dog Ear Publishing. pp. 211–216. ISBN 1-59858-608-4. Retrieved 12 May 2013. This page was last edited on 15 April 2019, at 04:05 (UTC).